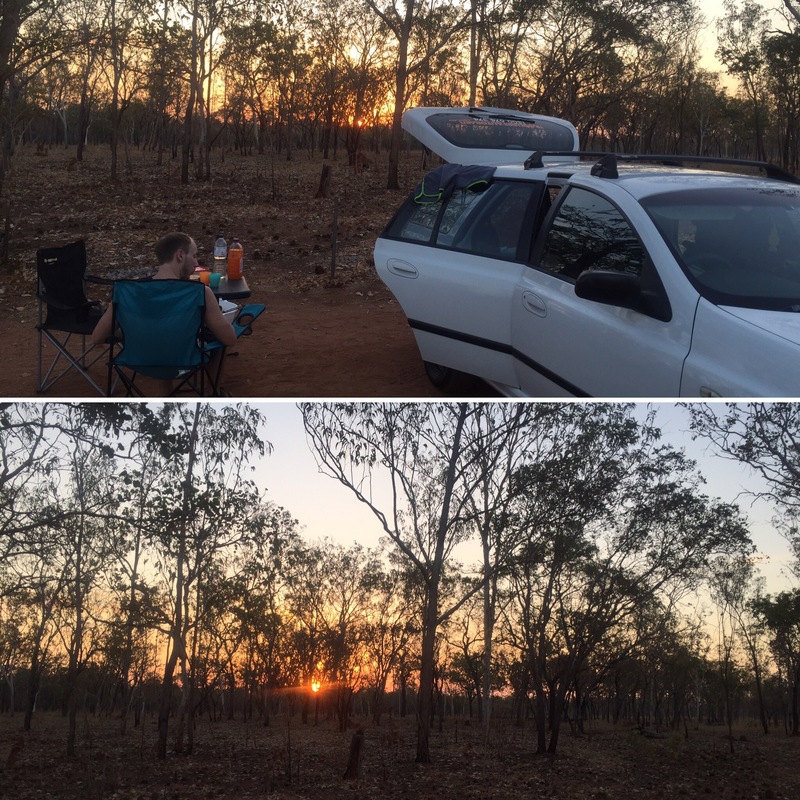 On Friday 22nd September 2017 we picked up our station wagon from Travellers Autobarn that would be acting as our home for the next 3 weeks as we drove from Darwin across to Perth ready to fly out on the 12th October. 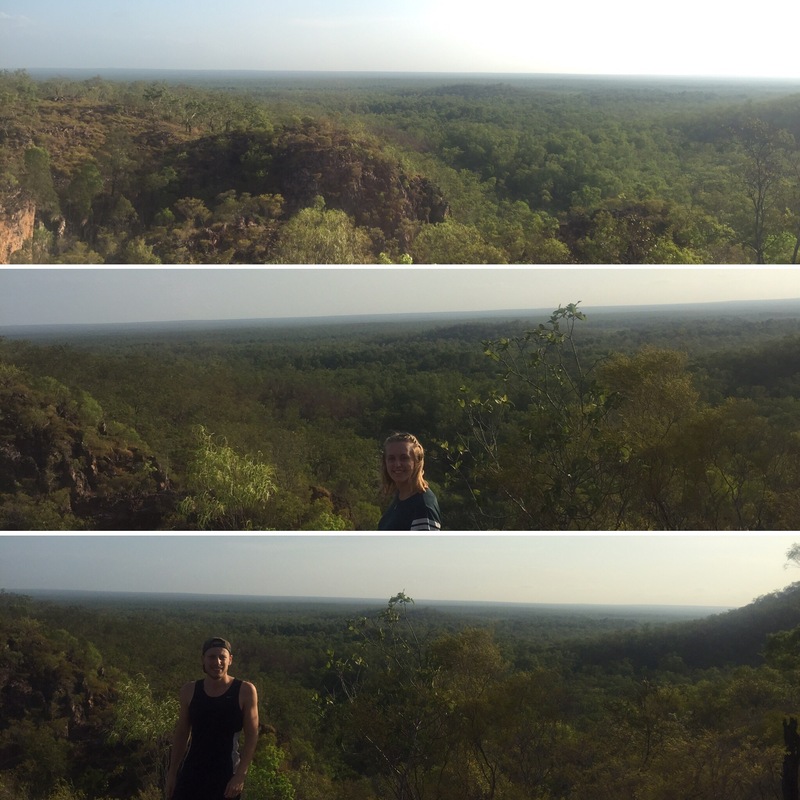 We went and bought all our camping supplies, food and water then headed to our first stop, Litchfield National Park – around two hours outside of Darwin. 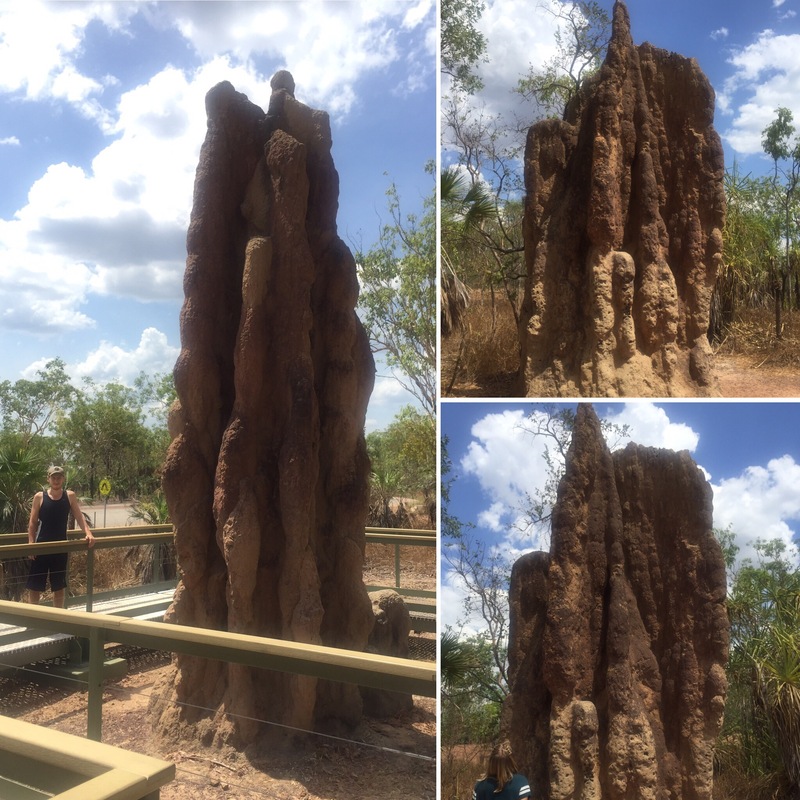 Our first stop in the national park are ginormous magnetic termite mounds. They are made by cathedral termites and the one surrounded by the barrier in the picture below is estimated to be around 50 years old. It’s incredible that something so small can make something so massive. We had seen some before on the journey up from Alice Springs to Darwin but these ones were definitely the biggest we’ve seen. 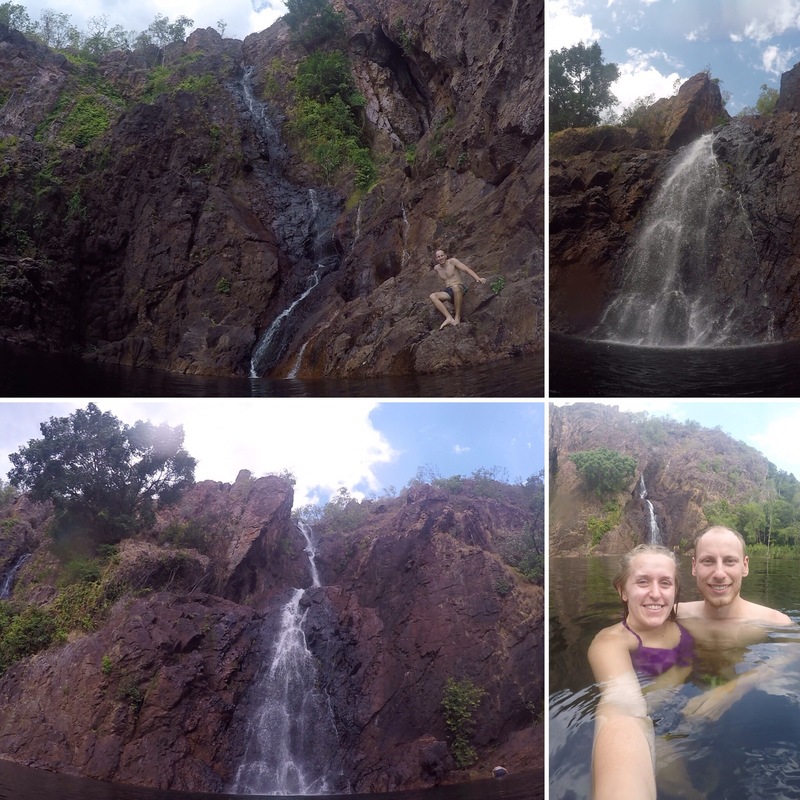 Our next stop, and where we would be camping for the night, was Wangi Falls (pronounced Wong-guy). 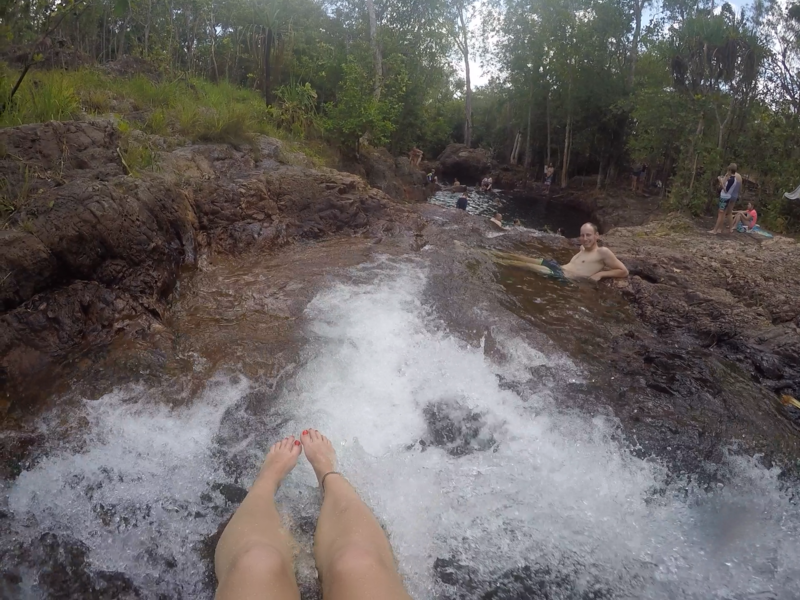 This was a pretty double falls with a big plunge pool at the bottom of it. 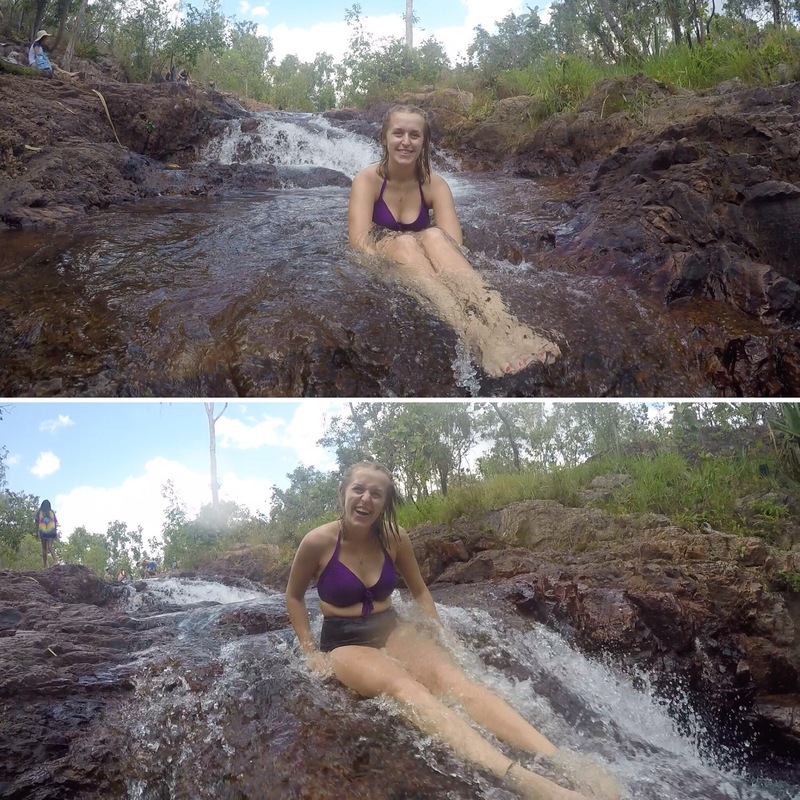 The water was really cool which was perfect as it was a hot day (the north of Australia is similar to Asia so very hot and humid). 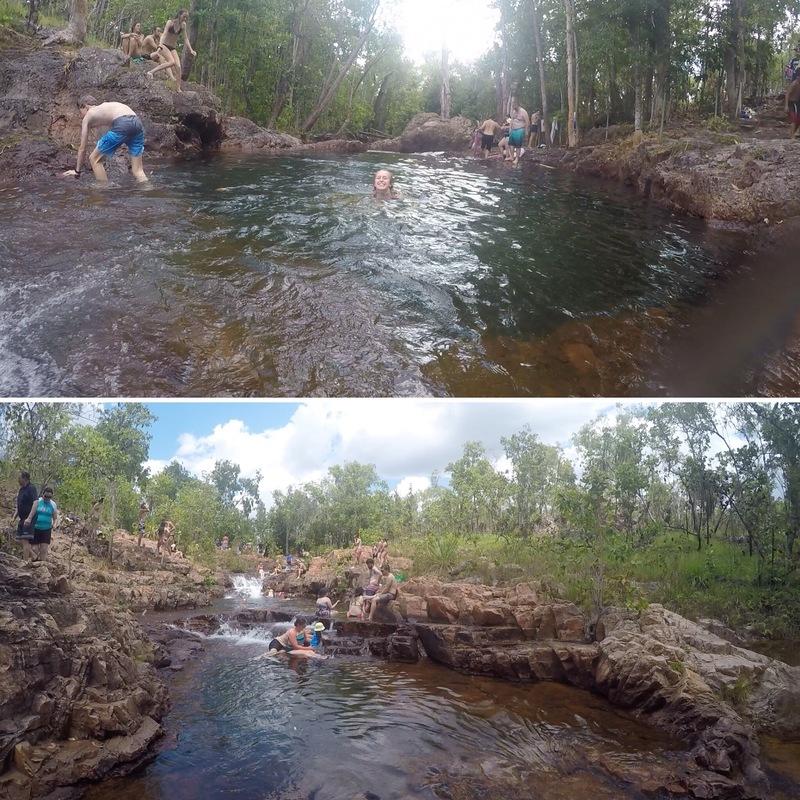 This waterfall did have a chance of having crocodiles, so even though a lot of people were in there swimming and they close it when there are sightings, it still pops into your head every now and again when you’re swimming about. I read on the signs that in wet season, because of the sheer amount of rain and the flooding everywhere, that the place gets closed because of the salt water crocodiles – yikes! 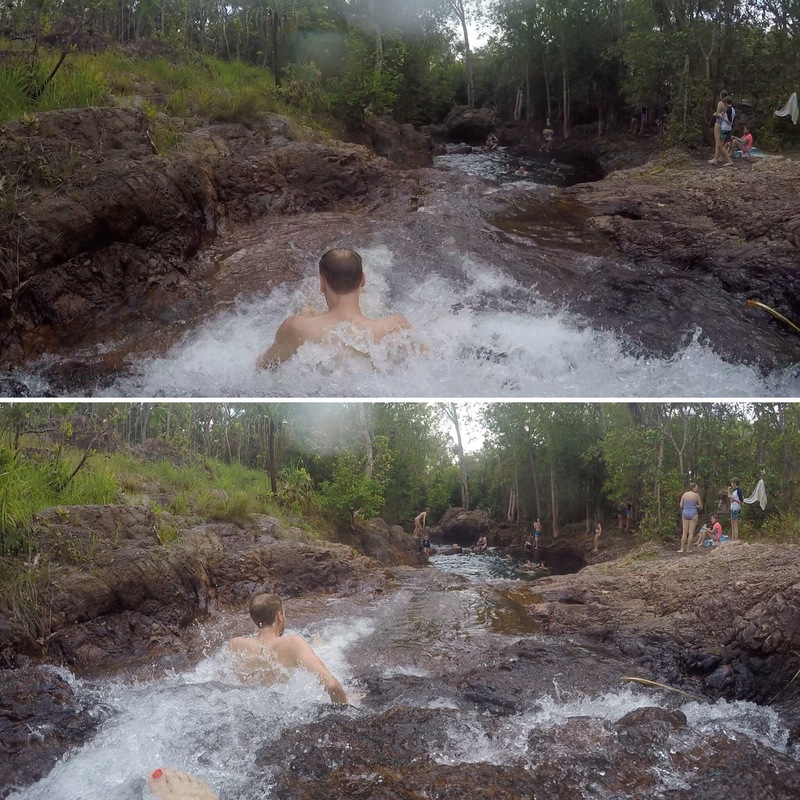 Despite this, it is a very popular swimming spot so it must be very rare to get crocodiles in there during the dry season. Before setting up camp, we headed to Tolmer Falls viewpoint. This has really nice views for miles of the forest within the national park as well as a big waterfall. The falls were set inside a huge canyon and, although it would still have been a lot of water, it wasn’t as full as if it was the wet season. There were so many flies here so we didn’t stay too long and the sun was starting to set so we had to get back and set up camp. 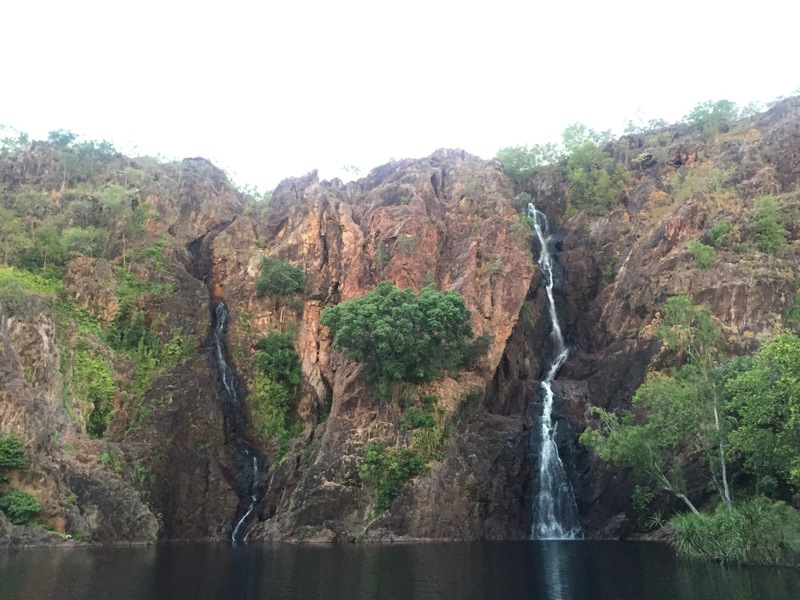 Once we were back at camp we parked up and then went to have a last look at the Wangi Falls before getting the car ready for camp. While walking through the forest surrounding the falls we saw some wild pigs which was cool as we hadn’t expected to see any. When we first pulled up we saw wallabies which was cool and a baby one spent ages by our camp. 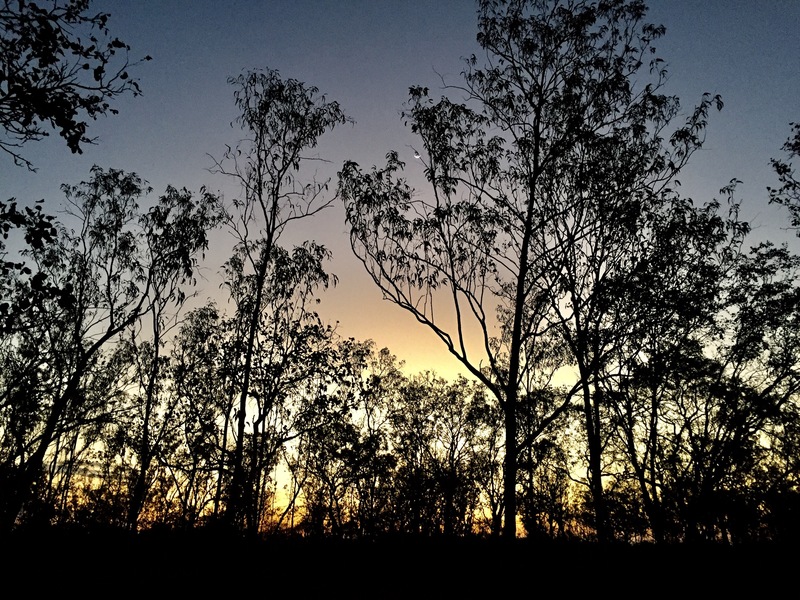 By the time we had sorted out the car to sleep in it was dark which made it hard to cook the food because of the amount of flies around but at least that was the first lesson of the trip learnt early on – cook while it’s still light! 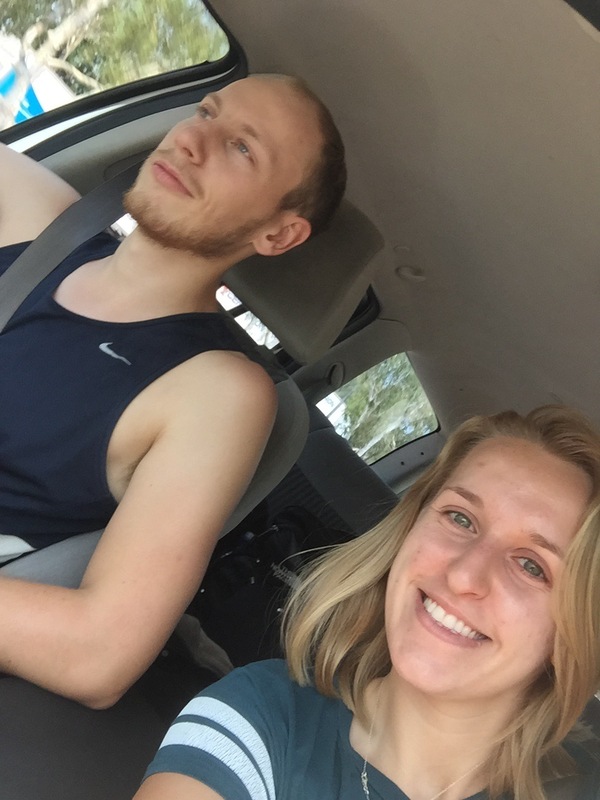 The car was really hot and humid so it was very difficult to get to sleep – I guess that’s because we were essentially sleeping in a metal box in a hot country – but we both managed to sleep eventually so it wasn’t a terrible nights sleep. 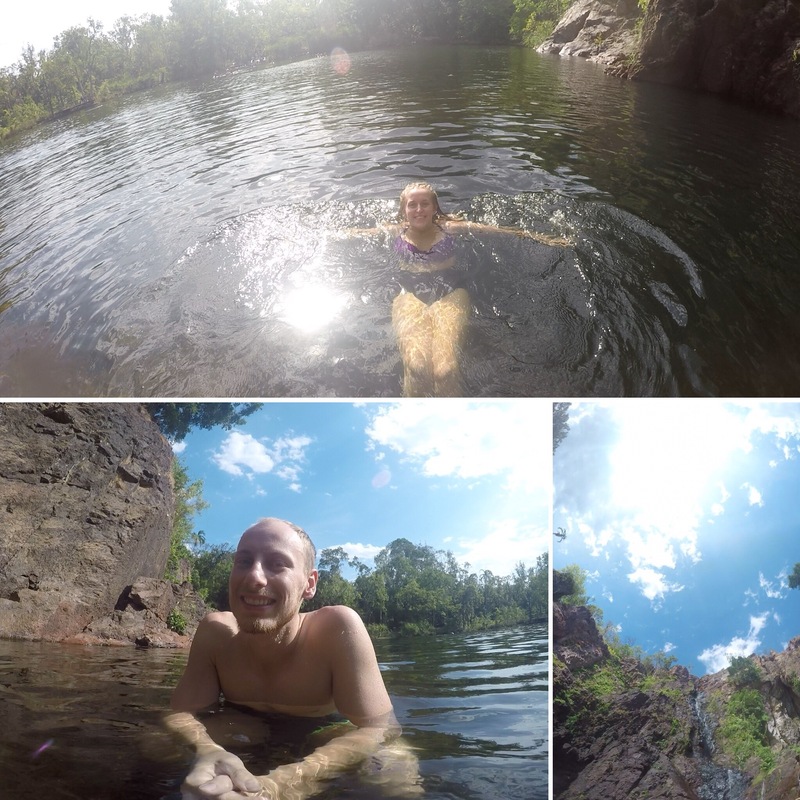 After a hot night in the car we were looking forward to getting back swimming (what Litchfield is known for). 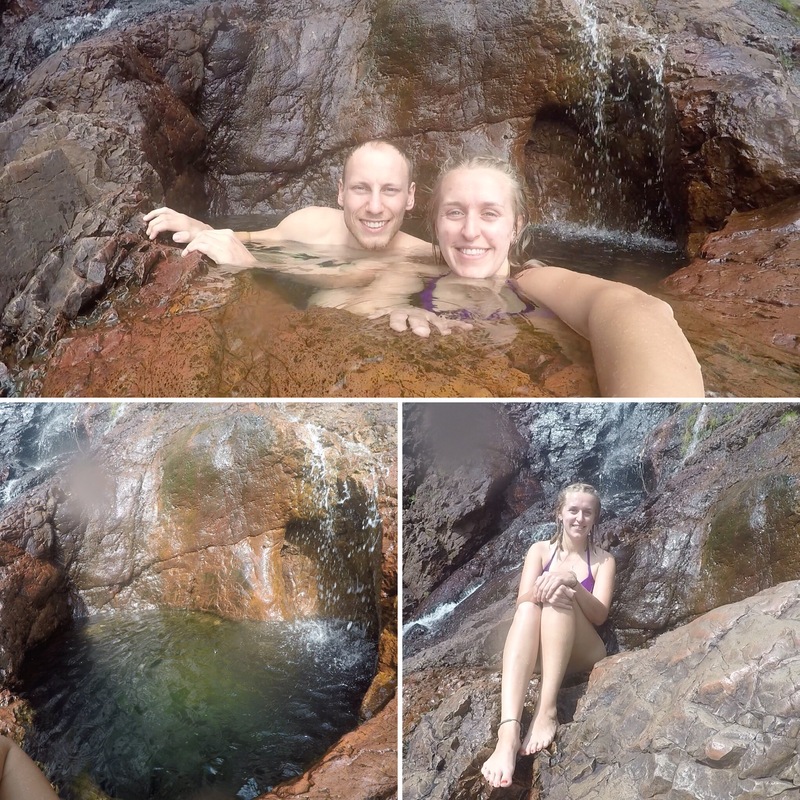 Our first stop of the day was the Buley Rockhole. As it as a Saturday it was really busy with local Aussies but still a great place to visit (I highly recommend). 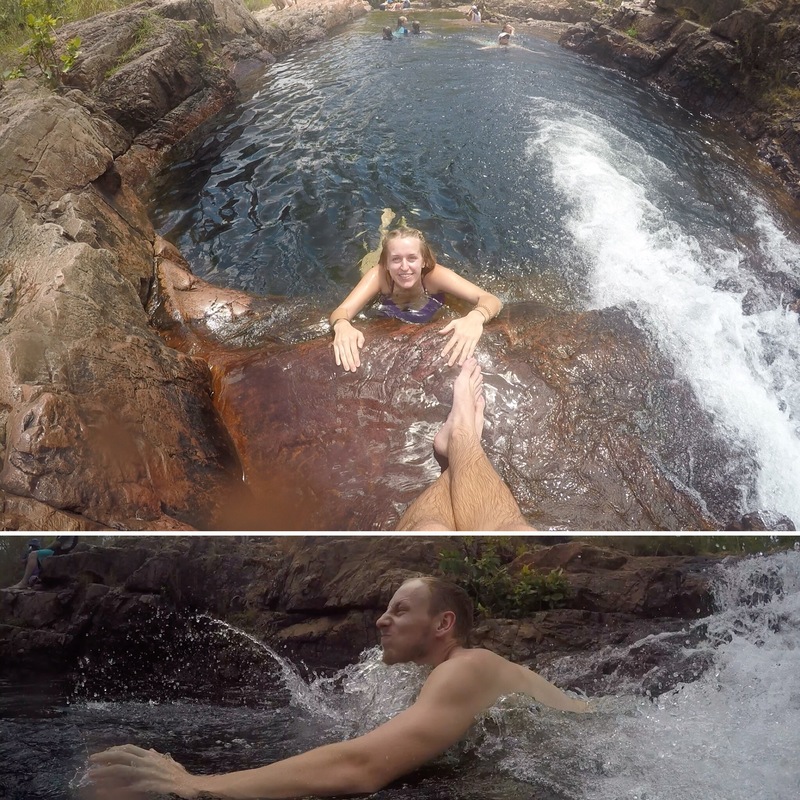 The rockholes are a number of swimming pools that are connected by small waterfalls and rushing streams so you can start at the top and slide and climb your way down to the bottom of the pools. 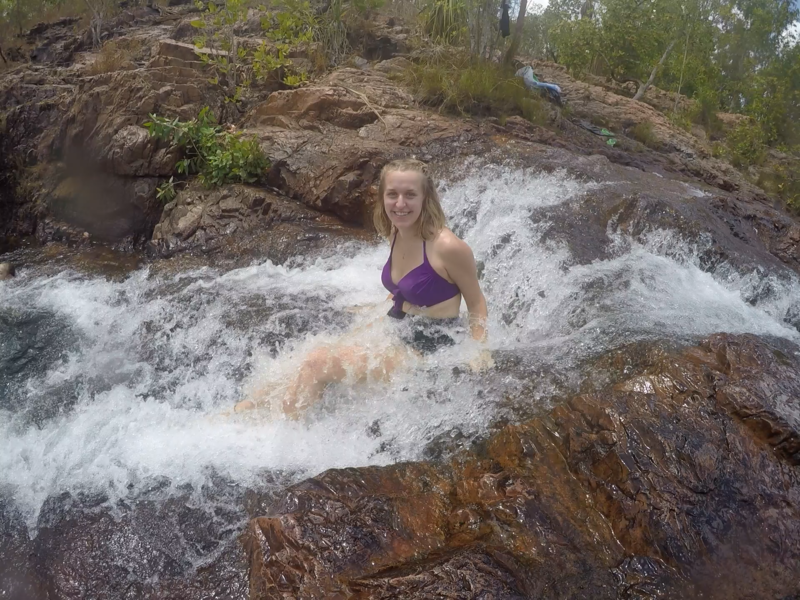 The water was a great temperature on a hot day and we spent a couple of hours here relaxing in the different pools and clambering on the waterfalls. This was probably our favourite place in the National Park! 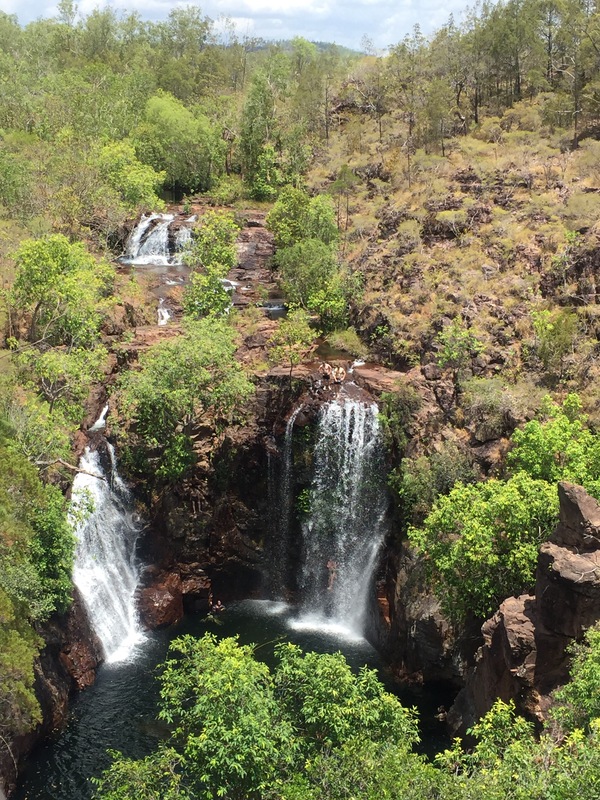 Further down the river to the Buley Rockholes is Florence Falls. 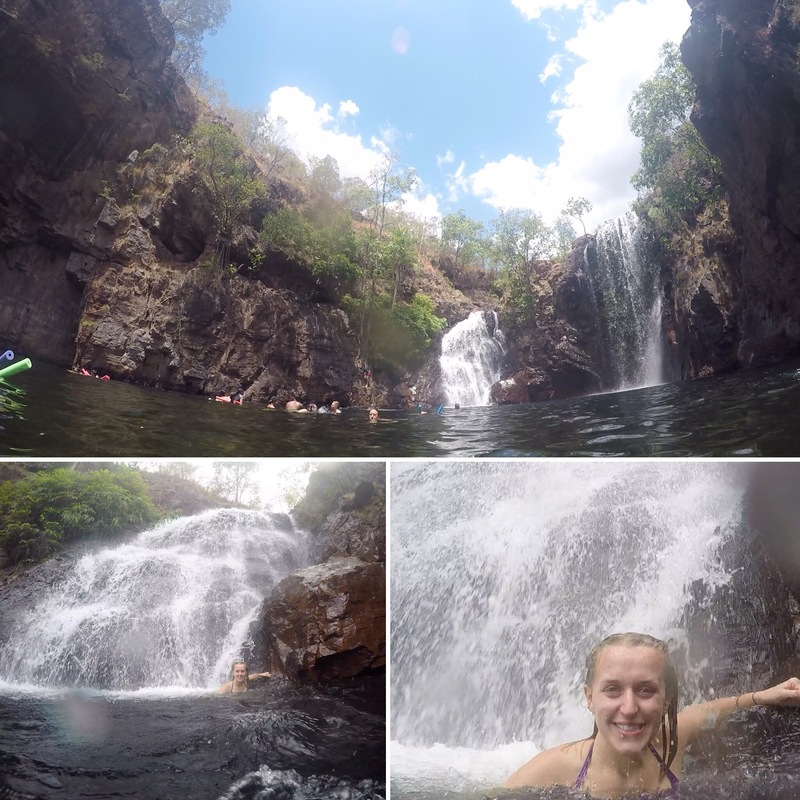 This is another lovely waterfall which has a double falls like Wangi. This has a large watering hole but has much deeper sections and people were jumping off the top of the waterfalls into them (it didn’t look terribly safe to do this)! This was our last stop of the day before driving further west to our campground for the night. Because of how hot it got we could even drive in our wet swimwear and we’d know the car would dry out! It was just a 4 hour drive that day and only on two roads. Luckily our car has cruise control so that makes the journey easier. 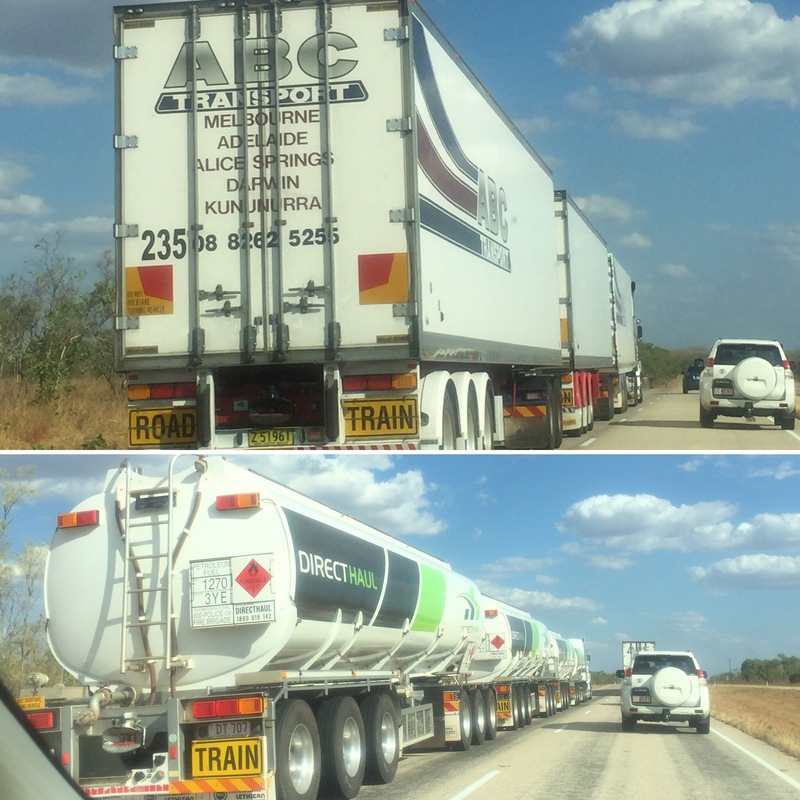 Australia has something called road trains which are lorries pulling up to 4 or 5 trailers behind it. They’re so long and can be hard to overtake. Luckily we have a 4 litre car with plenty of power that helps us get past them! I guess when the roads are so straight it’s no issue having these. 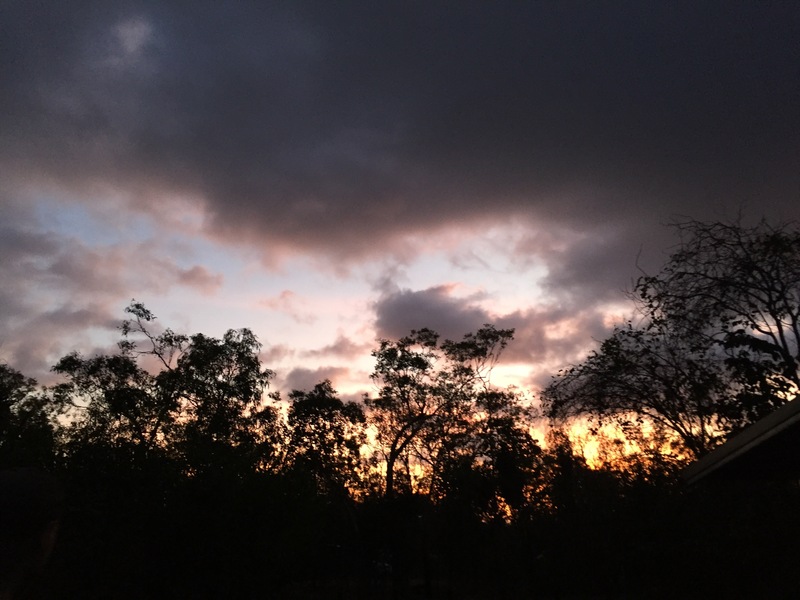 That evening, we stayed at Vince Connolly Limestone Creek which is a dirt park off the side of the Victoria Highway (the main road we would be driving on) with some toilets, picnic tablets, parking spaces and drinking water. There were 4 vehicles staying there that night (a couple cars and a caravan) and because we had moved south, it wasn’t as humid but was still hot – something we just had to get used to. 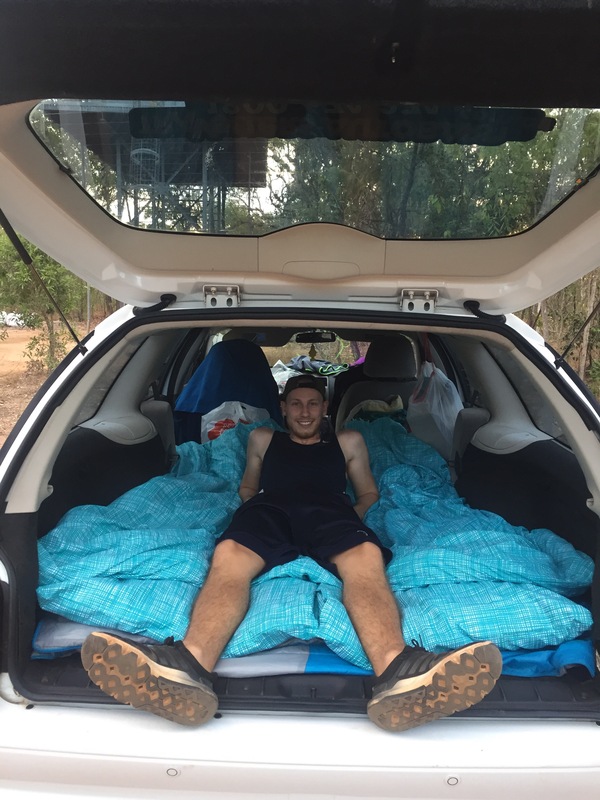 We had an app called WikiCamps that showed you where all the camping spots were in Australia and let you select whether you wanted them to be free, have toilets, showers, drinking water etc. which really was a godsend to know the best places to stop for the night – we can thank our friend Mark from the hostel for that app as he gave it to us! So far the road trip was going well and we were starting to find our feet when it came to living out of a car. We had really enjoyed Litchfield and had a lot of exciting things planned for the next few weeks to end our time in Australia.